Daemon Trilogy: Subrosa App Now Available! Daemon Trilogy: Subrosa is available this month! This drafting card game is all about ambition and deception to gain the upper hand on your opponents. 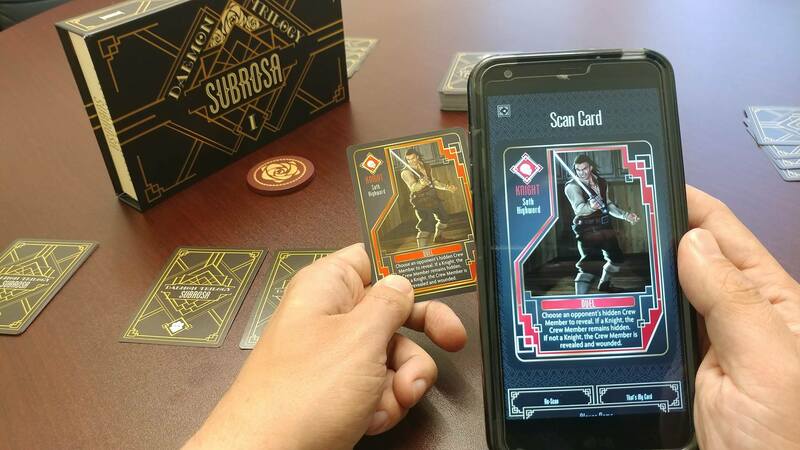 Subrosa uses App-enhanced gameplay, bringing a modern flair to the traditional card game, and making it easier than ever to deceive your opponents and get the upper-hand. The App is now available in Apple and Google Play stores! Created by Monocle Society, who is focused on creating AR and app-enhancements for tabletop games, the App helps to streamline gameplay and enhance the game by keeping moves hidden. Having players use their cunning and deception to determine who is working against them. This App works with the players on a single device, as players pass the device around after scanning the card and selecting their move. The App then lets players know what actions were done and the order of play. While the game can also be played without the App, we encourage players to get this free App to create a more exciting game experience which captures the feel of the world of The Daemon Trilogy. The Daemon Trilogy is in a world of Noble Houses who have captured Daemons and used their abilities and power to grow their own renown and wealth. Using notable characters, assassins, mercenaries and other devious tactics, players will continue growing the riches of their house, or fall to the power of another. 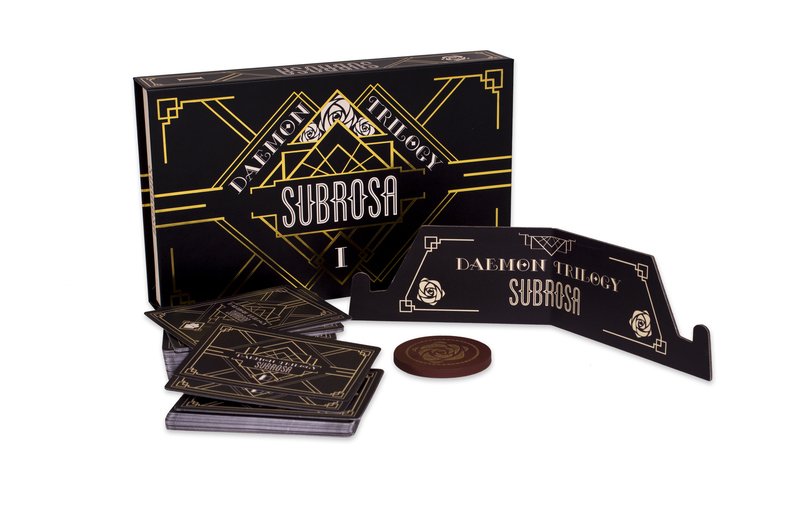 Designed by Nathan Weisman of March Hare, with oversight by Jordan Weisman, Daemon Trilogy: Subrosa uses App-enhanced gameplay, allowing 2-5 players to perform secret actions and abilities giving everyone the shadow of secrecy to best play cards and collect their contracts. Using image recognition software that scans each card, players can utilize a single device, or login with multiple devices to play. Daemon Trilogy: Subrosa will be available in your local game store this month. ← Outpost: Siberia Survival Guide/Rules Update Now Available!